The use of tartan patriotism and stereotypical Scottish humor goes back to Sir Harry Lauder and music hall songs at the turn of the 20th Century. In the 1960s, this genre was showcased by the entertainer Andy Stewart. Born in Glasgow, Scotland, in 1933, Stewart enjoyed a number of international hits including “Donald Where’s Your Troosers?” and “A Scottish Soldier”. In his school years he appeared in numbers of acting roles and eventually studied acting in college. Out of college he was immediately scouted to perform in dramas, variety shows and stand-up comedy. 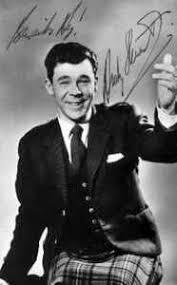 After opening for Billy Eckstine in Manchester, Stewart appeared across Scotland and England as a comedy impressionist with James Stewart, James Cagney, Elvis Presley, Petula Clark, Charles Laughton, Perry Como, Johnnie Ray, Al Jolson and Louis Armstrong among his repertoire. One of his most popular routines was to perform the well-known and peculiarly Scottish song, “Ye Cannae Shove yer Granny Aff a Bus”, in the voices of American stars like Jolson or Armstrong. He was also known as the compere of BBC Scotland TV show The White Heather Club that was shown each New Year’s Eve between 1957 and 1968. On July 3, 1958, Stewart appeared before Her Majesty The Queen and The Duke of Edinburgh at a theatre in Edinburgh. In 1959, Andy Stewart signed his first recording contract with the small British label of Top Rank. 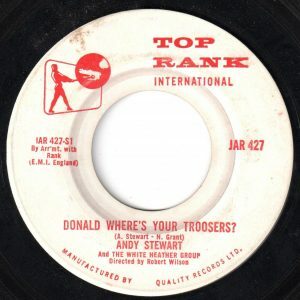 His first recording, “Donald Where’s Your Troosers?” was a light-hearted, almost throwaway track, during a recording session with his White Heather Group. However Top Rank considered it worth releasing as a 45 RPM single. For Andy’s next single release, he chose “A Scottish Soldier”. Andy had based the song on an old pipe-tune, “The Green Hills of Tyrol.” He’d first heart the tune as a boy when the family visited Braemar Highland Games. The song had been growing in popularity following repeat performances on The White Heather Club. Stewart recalls, “I got an idea for the lyric for the song. It was a story about a Scottish soldier who finds himself in a far land, his soldiering days are over and the call of his own country takes him back for his final resting to Scotland. And I sat down and the words just came to me: “there was a soldier, a Scottish soldier…” Though he got a backlash from some Scottish traditionalists who believed he’d ruined “The Green Hills of Tyrol” by putting words to the tune, Stewart knew the melody was actually a traditional Swiss air heard in Sardinia and borrowed by a Scottish Pipe-Major during the Crimean War. The song spent 40 weeks on the UK charts, peaking at #19, and became the fourth biggest single for the year 1961 in the UK. The song also became the third biggest seller for sheet music in 1961 in the UK. In 1963 Stewart went on a world tour that included stops at the Sydney Opera House in Sydney, Australia, Carnegie Hall in New York City, stops in Hong Kong, Canada, New Zealand, Tasmania, South Africa, Southern Rhodesia and other countries. In the course of his career Stewart appeared in many TV specials and shows including television shows over the years including: Andy Stewart in London (1962), The Saturday Show (1962), The Andy Stewart Show (1963), The Man Behind the Star (1965), A Song for Scotland (1966), The London Palladium Show (1967), The Scottish Minstrel (1967), Stewart Style (1969), The Andy Stewart Show (1970), Stars on Sunday (1971), The Andy Stewart Show (1975) and Andy’s Party (1978). Into the 1980’s Andy Stewart was becoming a symbol of the “Old Scotland” for many Scots who were embarrassed by perpetual images of haggis, Hogmanay and kilts as representing Scotland. He spent much of the decade touring internationally. But in 1989 “Donald Where’s Your Troosers?” was reissued and climbed to #4 on the UK charts. Stewart was back in fashion, including in Scotland. During his career Andy Stewart released 26 studio albums and one live album. Plagued with ill-health most of his adult life, especially due to high cholesterol levels, Stewart died at the age of 60 in 1993. Since his death over a have a dozen compilation CD releases have been made available to showcase the work of one of Scotland’s greatest comics.